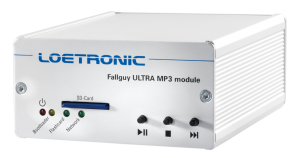 The Fallguy ULTRA MP3 module (Article No.0132) is a universal and compact embedded module for playing compressed audio files (MP3). The module was specially developed for use in embedded systems and for integration in customer-specific environments. It is particularly characterized by its use in harsh industrial environmental conditions. The module has an SD card slot for SD and SDHC flash cards. 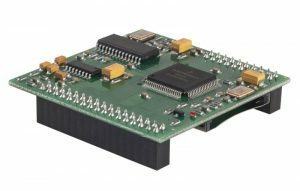 Depending on the customer’s requirements, the internal firmware of the module is adapted to the application-specific requirements. The playback behavior of the module is determined by the firmware used. The Fallguy ULTRA MP3 module is also available as a finished audio player in an aluminium housing. The Fallguy ULTRA MP3 player (Article No.0175) is the first choice for all museum and media installations! Three buttons, the SD card slot and four LEDs are located on the front, on the back various interfaces are accessible. 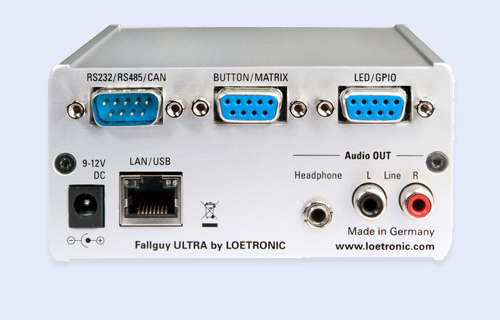 A LAN or USB interface can be optionally equipped. Stereo headphones (3.5mm jack) or an external stereo amplifier (2x cinch sockets) can be connected. As an audio player with integrated powerful amplifier for museum and media installations, the Fallguy ULTRA AMPII MP3 player is ideal. The player can be optionally equipped with (Article No.0177) or without (Article No.0176) front LC display. Similar to the ULTRA MP3 player, it has three buttons on the front and various interfaces on the back. A LAN or USB interface can be optionally equipped. 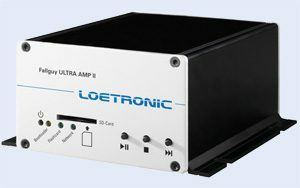 The internal 2x25W amplifier directly controls the connected speakers. Lateral mounting rails ensure a stable installation. 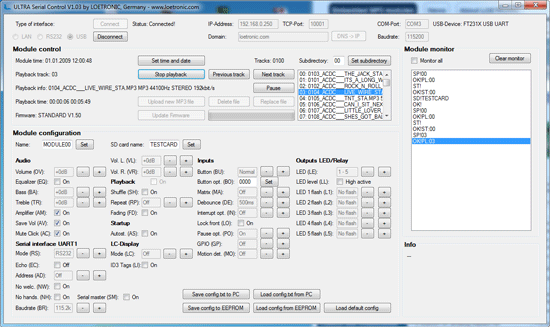 For remote control and configuration of the ULTRA MP3 module or the ULTRA MP3 player and for loading new MP3 files onto the SD card, LOETRONIC offers the ULTRA Serial control Software for Windows PCs. 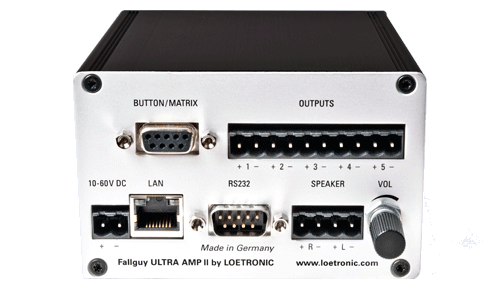 The software communicates via the RS232, LAN and USB interfaces and is constantly being expanded with new functions. 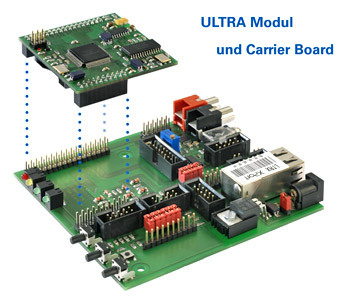 The ULTRA Carrier board (Article No.0129) is the optimal motherboard for the ULTRA MP3 module. 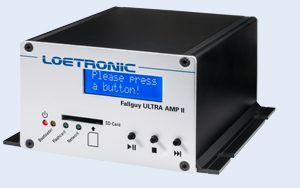 In addition to RS232, RS485, LAN and USB interfaces, it provides connections for buttons, LEDs, an LC display and the audio connections including a headphone amplifier. Another motherboard is the ULTRA AMPII Carrier board (Article No.0136). 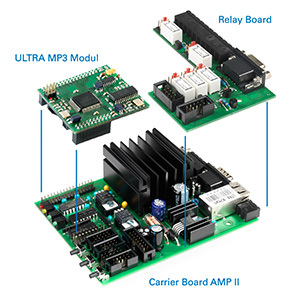 Similar to the standard Carrier board, it provides many connectivity options. Instead of a headphone amplifier, a powerful 2x25W amplifier is integrated. An optional Relay board (Article No.0139) can be used to switch up to 5 relays synchronously to the audio playback. 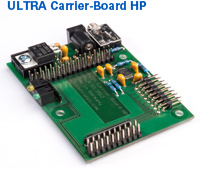 If the above extensive connections are not required, a slimmed-down motherboard, the ULTRA Carrier board HP (Article No.0152) with headphone amplifier and button inputs can be used!